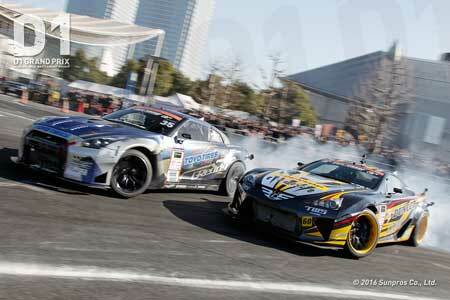 D1 Grand Prix is the competition to decide the victor with the coolness drift drive performance. 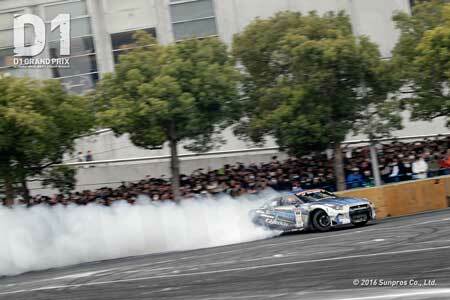 Drifting is a drive to side slip rear wheels or all tires. While maintaining control with high balance, wheels are pointing in the opposite direction to the turn within exceeding the regular driving. The greatest attraction of drift is beyond further extraordinary movement. At the race, a driver starts drifting in sliding from much further stand point and passes the corner by revving up engine to speed up with a big white smoke. This is the coolness point where dynamic and acrobatic actions are appealing the sense of viewers directly. The battle very much accounts on a driver’s skill rather than the power of machine performance. 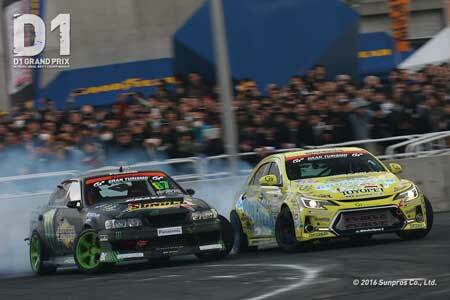 D1 Grand Prix is the competition to race for drift skill and technic! Solo performance to compete the accuracy of drift technic ! Tanso (solo run) is to strive for getting scores by individual passes. Here, the accuracy of technic is judged. “Comprehensive elements such as “angle” or “speed” is evaluated by D1 original “DOSS” mechanical scoring system as well as an advance guidelines including the course line given by a judge. Basically the larger angle, higher speed, steadily engine sound and smoother performance, the higher scores a driver can be awarded. The quicker entering or angle turn helps get higher evaluation. On the contrary, spinning or drifting back deducts big points. 2 runs are delivered at the session and higher score is considered to settle the ranking. One to one drift battle tournament ! The true battle starts from here. All of qualifiers matches one to one by the tournament system. At Tsuiso run, drivers are paired off according to the ranking settled at Tanso race and each driver takes a turn between a leading car and chasing car. A leading car has to show the best performance and a chasing car is required to drive with maintaining a close gap while chasing under drift conditions. If a chasing car can drive the same or larger angle while maintain the state of inside of a leading car, a chasing car gets win. If it is too distance between 2 cars, drift angle is smaller than opponent or drift driving distance is too short, it means lost. Also spinning, under steering or loosing balance is the subject of deduct points. As a driver has to match a low speed drifting toward a low speed opponent, not always a high power car wins. Driving line does not really effect the judge compared to Tanso race, but if a leading car get a line too inside not giving any space to a chasing car, this action also loses scores. The session takes place with 2 driving runs in total by taking a turn. Each driver is given 10 points out of 10 by each judge and the victory is determined in totaling scores for 2 driving performances. This system determines a champion.